A British climber has set a world record by making a mobile phone call from the top of Mount Everest. In the early hours of 21 May, Rod Baber made two calls from the mountain's north ridge. In the first call Mr Baber described the view, how cold it was and what he wanted to do when back at base camp; he then rang his wife and children. The calls were made possible when China set up a mobile base station with a line of sight to the north ridge. Mr Baber set off from the UK for the Himalayas on 30 March and since mid-April has been getting used to living at high altitude. Prior to 15 May, when the final ascent began, Mr Baber and the other members of the expedition had been trekking up and down Everest to familiarise themselves with the route and prepare their bodies for the punishing ordeal. To make the call at the summit, 8,848 metres, Mr Baber had to contend with high winds and temperatures of -30 degrees. The call was made to a voicemail account created by sponsor Motorola to ensure the attempt was recorded. Mr Baber also did not have much time to make the call because those climbing Everest typically only stay at the summit for 15 minutes. Making such a call is dangerous as talking into the handset meant he had to remove his oxygen mask. Batteries for the Motorola handset he used were taped to his body to ensure they stayed at a high enough temperature to power the phone. Mr Baber also claimed a separate record for sending the highest text message. 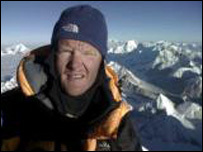 From base camp before making the attempt to reach the summit of Everest, Mr Baber said: "Everest symbolises the greatest challenge to any climber." He added that making the call from the mountain was a "once in a lifetime" opportunity.